It all started with Takashi Murakami’s essay titled “Superflat,” a concept that explains the Japanese aesthetic sensibilities and how modern Japanese popular culture bridges influence coming from the Edo period. Murakami earned a PhD in Fine Arts in the Nihonga painting school. Intrigued by his visual techniques, I started researching Nihonga painting (traditional Japanese painting using mineral pigments). Shortly after I learned that instruction in Nihonga painting, whether it is books or the web, is scarce. After months of surfing the vast Internet I came across Judith Kruger a Nihonga artist and teacher. She was taught under Makoto Fujimara, who also studied alongside Takashi Murakami. 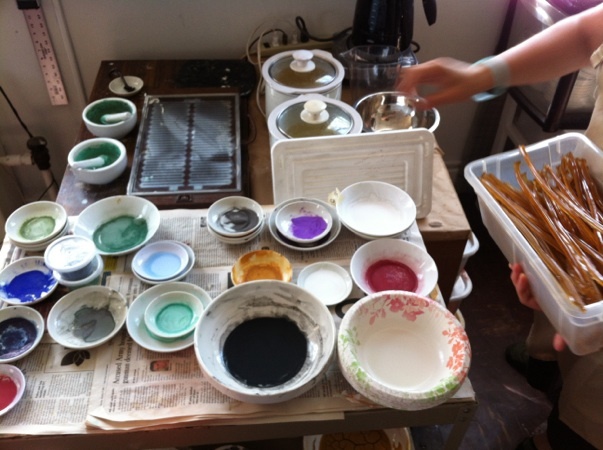 Finally, a Nihonga painting course available in the US! After a good year of communication with Judy, she notifies me via e-mail of an upcoming Nihonga course which taking place in Savannah, Georgia. Realizing the rare opportunity, I began planning my trip to Georgia that same week. June 14th, 2012 (also the day of my graduation ceremony at Tacoma Community College) was the first day of classes, lasting through Sunday in a total of 3 days of classes. Before classes began I took the time to check out Savannah and it’s historic district in downtown. Despite the extreme heat and humidity, I lugged around two heavy bags before I met with my hotel mate later that evening (Mark). Susan and Eileen were the two other students who were in Savannah the same reason I was. On the first day of classes Judy introduced Nanou, a fun and amazing woman from Australia who took up an artist residency with Judith. She is a profound artist and provided great insight to the art of Nihonga. 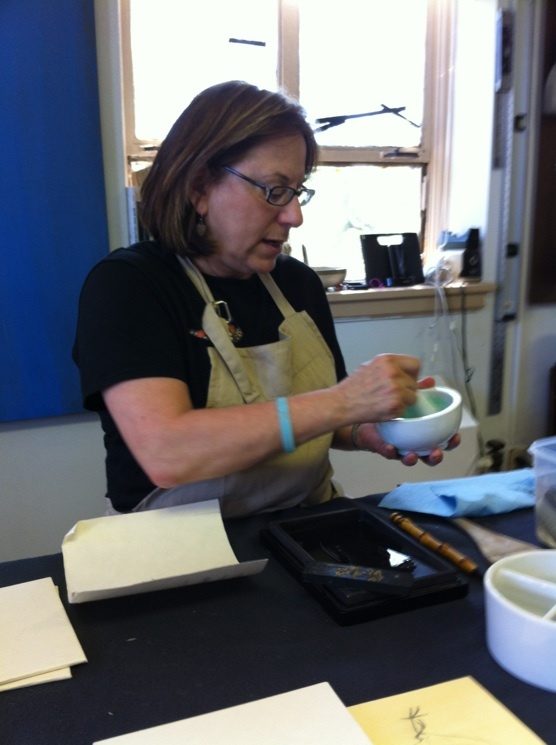 Judy started off the class with a short history on pigments and Nihonga painting, providing a good foundation for what is to come. We delve into the course with familiarizing ourselves with tools, pigments, and techniques of Nihonga painting. Judy articulated her instruction to where it can be easily understood by us Westerners. I can tell she is very knowledgeable on this subject. Her large-scale works loomed in presence for additional inspiration and visual example of the product of Nihonga painting. Our first lesson involved Japanese papers and mounting them on various substrates such as stretching silk on a frame or paper onto a board. We also learned about the importance of cowhide glue (nikawa), sizing (dosa), and the different natures of various types of Japanese paper (washi). Throughout each lesson, Judy provides an interactive instruction and demonstrates the technique being taught. That has always helped me in the past to really get involved with actively practicing the new materials. Continuing onto the second day, we were introduced to natural pigments used in traditional Japanese painting such as azurite or malachite. This is when I first realized the beauty behind using mineral pigments in painting. The different grain sizes are emphasized in Nihonga painting, being utilized for specific purposes such as color, texture, or sheen. Like oil in oil paint, cowhide glue is used as the binder for the mineral pigments in Nihonga. The strength and weakness of the glue must be strategically considered when painting with different grit sizes and materials. 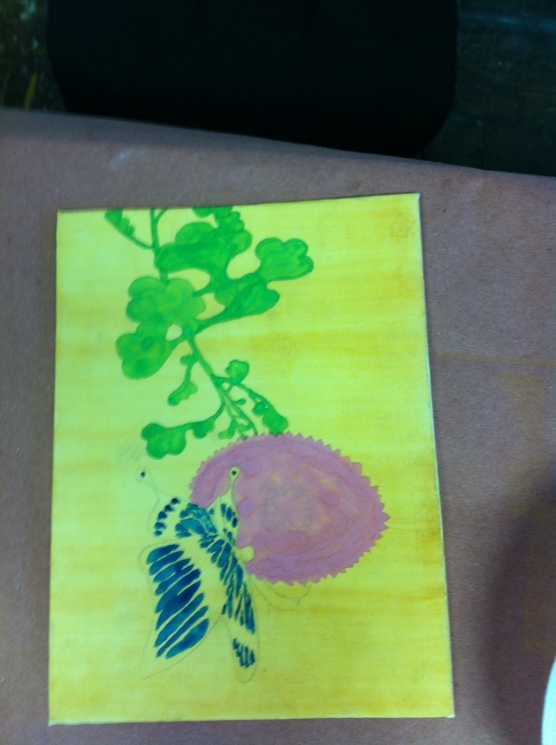 We proceeded with our drawings on our substrates so we can begin playing with the new pigments. Judy then talked about other techniques used in Nihonga and talked about different artists in Nihonga painting history. During the painting process Judy gave personal critiques every step of the way. Due to the small class size, we had an advantage of asking for the instructor’s assistance and guidance more so than a typical college class. Finally the third day, we proceeded into advanced techniques including gold leafing and patinas. We also used this day to complete our works. By this day we indulged in each other’s company, adding a bit more personality into this whole trip. 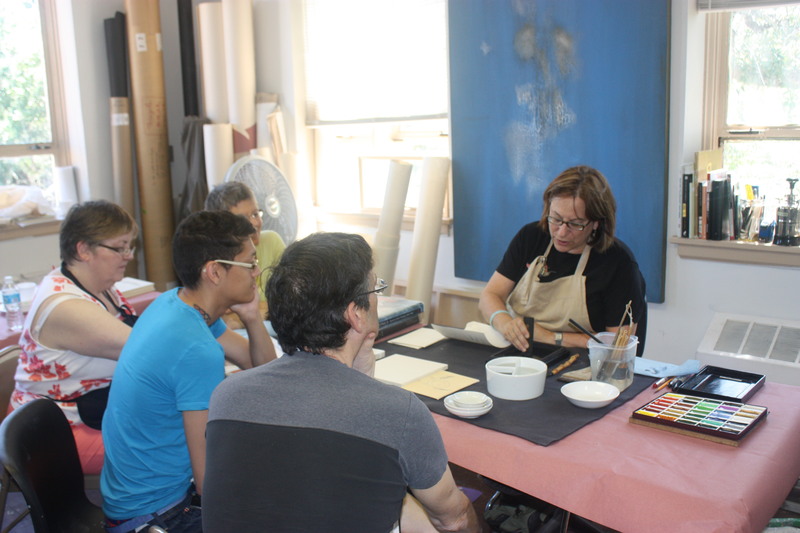 This is the day we really went over the various Japanese terms used in Nihonga painting and learned more about strategies when approaching and creating a traditional Japanese painting with mineral pigments. By the end of the day, Judy was gracious enough to provide available Nihonga pigments and products to sell to the students. The materials used are often imported and expensive, so she certainly considered convenience and options for the students taking her course. To conclude, my experience with Judith Kruger’s Nihonga painting course took me to a whole new perspective of painting. 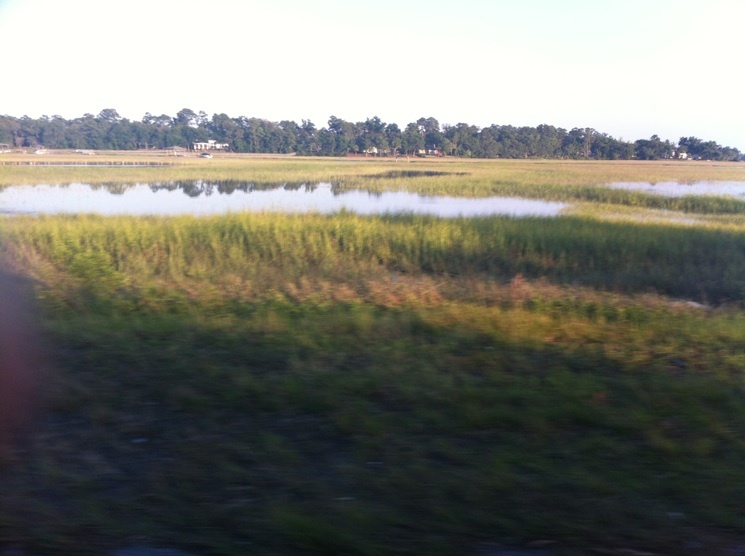 It was also a rejuvenating social experience when I met so many people and indulged in the nightlife in Savannah. SCAD, which seems to also own most of downtown Savannah, also has a strong influence reigning on the city through the students and faculty. The knowledge gained has made a fine addition to my skills in Western painting and Asian art research. Her instructions were very clear and the demonstrations were hands-on. There is a lot of information covered for a short amount of time but that’s when note-taking skills come in. The evenings after each class day has proved to be a fun experience as well. We went to dinner and Judy even invited the students to her own home for dinner and to show her wonderful art book collection (some which are out-of-print). She has a vast network of resources she has to offer to all academic and professional crowds. If you ever had any form of interests in traditional Japanese paintings, I would highly recommend Judith Kruger’s course in Nihonga. You may check out her website at www.judithkruger.com for her portfolio or if you have any inquiries. Your Nihonga painting experience sounds amazing. I love to see culture blended together through the arts. Wow that’s amazing Philip! I think that’s the same place my grandma bought me my supplies! Theyre quite expensive though. It was amazing, quite memorable indeed ;).